The Washington Fields has always been a wide open area for future real estate expansion to take over as southeast St George Utah real estate busts at its seams. No more is this true than in the areas we like to call Little Valley found south and east in St George proper. 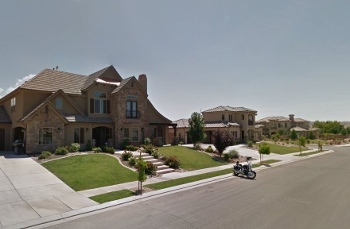 The largest new construction development in the St George area has been taking place in Little Valley the last few years of 2013-2017 with the newer Desert Hills schools as one of the main selling features. 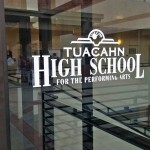 These new schools have shown their prowess in areas like sports and test scores. The below photo is of an intermediate school that is located in Little Valley called Sunrise Ridge and also The Fields at Little Valley as you can see are just adjacent to the school. The allure of these open fields, parks and good schools are what has helped spur on development in this area. Subdivisions inside Little Valley that have been filling up are: areas like Silkwood and Sun Valley Estates or homes along Crimson Ridge Drive. Silkwood has a nice little park to compliment it too. South Little Valley, directly south, has typically had some homes already built, like in Rancho Verde Estates, but some new ones have also been built. 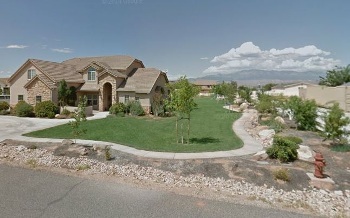 That subdivision and Little Valley Ranch Estates have been prior developed to have larger lots, even on up to an acre. In Little Valley there have been some single level homes built, but an increasing number of two level homes to accommodate larger families also dot the landscape. Salisbury has been responsible for a lot of these two story homes, where their original one level floor plan has incorporated on top of it the second level for a much more economical price. Those plans have since changed to include some new two story designs as well as the more modern finishes that blend well with the southwestern browns or more neutral colors. As fast as this has been taking fire, it seems that the areas left to build inside the Little Valley area have already mostly filled-in. Predating this wave of new homes, has been the wave encompassing the larger area of Washington Fields. This expansion has been miles further north and due east of St George. The presence of new grocery shopping such as Lin's Market has spurred on development in both these areas. 3000 East, as seen on the map above, running north and south, feeds on up to Lin's market that is now open for people on the East side of Virgin river. Further, a Smith's Marketplace and other stores have gone in just over on the west side of the river as well. So, the question remains, how much more land is there available east of Little Valley to develop? Well... not much, as it is very close to bumping right up to the the new St George Regional Airport. However, because there is a ridge line that seems to form a natural separator, it would seem that this does leave further expansion east plausible, up to that ridge line. There are lots of fields adjacent, to the north of Little Valley, that have left to be developed as well. Just straight east of Sunrise Ridge Intermediate, and barely north, there are some wide open fields that perhaps could be next; still part of St George proper. This would seem like the next best target for people being able to get a piece of this home grown pristine, rustic, removed superb feel without the big city connotations. Even further north inside mainly south Washington Fields, as St George boundaries have just pockets left, there is room for a lot more homes as well. Also a few further south in Little Valley, but not much, as the slant of the newer airport and the cliffy area separating it, are angled south and west, thereby crowding out any more room to build south. All of this new development begs the question: So what of the Desert Hills schools populations reaching a max? Even as Little Valley new construction busts at the seams, Washington Fields picks up and runs with the baton ushering in the advent of Crimson Cliffs schools. While it appears that new stores opening up may have encouraged further development beyond existing main road infrastructure, that the capacity of even the Desert Hills High has been fast approaching its limits! And of course the city of St George, always one step ahead, has been keeping up in pacing this population increase in students by unleashing the following school building projects with estimated completion deadlines. These even newer still schools could fuel even further new home construction and building into what is now Washington Fields. Crimson Cliffs High boundaries, ratified by the Board of Education in June of 2017. *Note: New school boundaries may be subject to change and will take effect when the new schools open. FACT: Based on the first 6 months of 2016, and the inventory at rate of sales, if no new homes came on the market, the time it would take to sell existing residential inventory in Bloomington Hills is about 2 months vs. 3-4 months for similar priced homes in the rest of Greater St George area. FACT: In Bloomington Hills, the average sales price for the first half of 2016 calculates to about $250,000. FACT: In Bloomington Hills, for the last two years (July 1, 2014 to June 30, 2015), 192 properties have sold- an average of 8 homes a month. Nearly all the homes listed have been eventually selling, even if they have had to do a price reduction or two. FACT: In Bloomington Hills, for the last 6 months of 2016, 46 properties have sold- an average of 7.7 homes sold per month. Inventory Levels Exception for Greater St George: OK, the average inventory levels for Bloomington Hills are about 2 months for the last two years. So, it is running about average. However, homes in the same price range for the rest of the Greater St George area have been averaging a 3-4 to 5 month supply of homes. The stats may be showing that there are fewer homes and maybe more demand for homes in Bloomington Hills than the rest of the areas that are selling at similar price points. There is an exception to this with the last two months of May and June of 2016, showing a more unusual 2-2.5 months supply in the Greater St George area. This may lead to homes in Bloomington Hills holding their values even further and inventory levels staying low in the short run, at least. My SG1 real estate team just sold many homes in this second half of 2015, many through people you might know if you live in the Bloomington Hills area, such names as Barney, Patterson or Woodcox. My SG1 team consists of my assistant Nicole Hirschi, my web developer Hilkiah Makemo and myself, Brian Habel. We host the #1 real estate trafficked site in the area, dwarfing any other Realtor, team or brokerage traffic in the area. This sale that just went through comes as a referral from Merrill and Melinda Barney. Merrill ran the Senior Games for the longest time and recently has let someone else take that on. And many know that Melinda also has a high profile of service that she does in her line of work in helping families. At any rate, some of their best friends from the Burbank California area, were wanting to make a change for the better in their situation and St George just seemed like a good fit, having wonderful medical facilities as well. I have so enjoyed getting to know Jim and Marty. All are excited in their friends new purchase! The Barneys were influential in helping them find a home on this end of their relocation. They were sensitive to their needs and kind of knew that once falling in love with a place, that this one home ‘just seems right for them, Brian’. I made sure to communicate and secure their interests. I needed the other Realtor to go along. The Churchs’, my buyers, still without seeing it, were wanting to get it off the market before somebody else would possibly buy it. Thus, we got it under contract for them. This was a feat, because it had this condition of her coming in much later to see it. 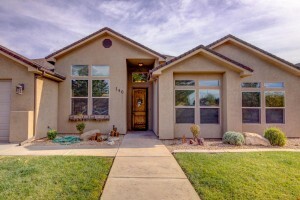 I was able to guarantee that we could take it off the market, while giving my buyers the ability to back out if they did not like it, and get their earnest money back. The other Realtor was so good to work with and I really helped her to see that my buyer was serious enough with it all, enough to take a chance on us. I got the other Realtor to persuade her seller to go for the deal. I think it significant to note that sometimes when there are two decision makers that both like to have a say in what is going on. It is the Realtors job to see to it that both spouses are feeling listened to and that the compromises that are being made are part of what they want me to do. Sometimes it takes staying out of the way and sometimes in being proactive to help pursue homes that are meeting both their needs. 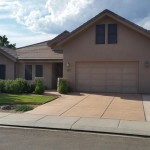 As to what Jim was also looking for in a home, was relayed by Marty, we had to make sure Jim’s green thumb needs would be maintained with having a yard to putz around in or a garage, would be important. With Jim just putting his trust in his good wife to secure this home, we all were so elated to learn that Jim loves the home more than he thought he would, after finally getting here the other night and finally seeing it, after it had been purchased. To know we also were able to make him happy was icing on the cake! All is well that ends well- THEY LOVE IT and it is now Closed, they own it as of December 7, 2015! The home is in Bridal Gate Estates. Another happy, happy ending!!! 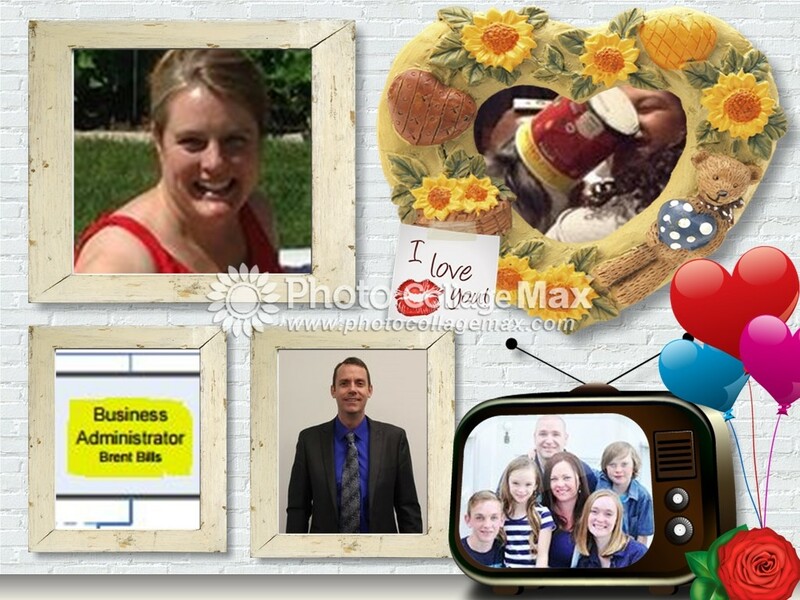 Many know the Pattersons to be this awesome fun loving family in our area! Well, Dana Patterson has a sister that needed help moving out here to be near her for the family support. Being a close knit family our options were limited to the Dixie Escalante power areas, mainly Bloomington Hills if we could. Our first opportunities were hot ones, getting the jump on one house before others, by calling and arranging an early showing. But then examining all the options we were constrained to wait for a better opportunity. We even reserved a lot through Salsbury new home construction out in one of their new budding subdivisions, but Jennifer was not completely satisfied with how fast those homes get thrown up some times. 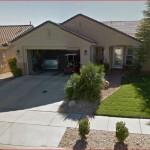 At any rate this home above, on Tamarisk, became available and we had to act fast. Like many times, we were Johnny on the Spot to help Jennifer secure her interests and she and the family could not be happier! Anyone that knows where Pat and Dana live, will know that Tamarisk is so close-by, that the family is literally able to see and support each other so much the easier. I hear Jennifer, being a decorator, has that home looking wonderful! Pat has been over helping modify one room into an extra bedroom and pantry. Pat really has a lot of skills and gives a lot. I am so excited for them and still need to get over and see the new changes I hear that went down- really nice I hear! Jennifer closed on her home on July 29, 2015. Jerry and Kristi Woodcox used to live in the Bloomington Hills south area just on Hemlock. 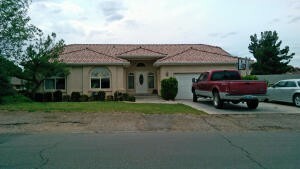 You might remember them from the picture of their house they were renting- see picture on left. Well, I just helped then get into their new home as a buyer (see picture on right), they closed on it September 3, 2015- see photo below of that homes inside living conditions. Nice eh? The home appraised I think it was at least 10K if not 15K higher than what we bought it for. Needless to say they are elated and showed their appreciation by providing me a referral that eventuated in a sale. They might not know it yet, but for Christmas there will be a gift certificate for eating out at their favorite restaurant! You can find Woodcox’s testimonial on Google here. Frank & Penny came as a referral from Jerry and Kristi Woodcox- THANK YOU!! As many of you know or should know, this is HOW MY BUSINESS WORKS- BY REFERRAL. 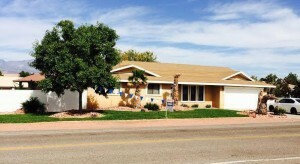 We just got Frank and Penny Giammona’s home under contract in December at that, and even more crazy- for top dollar! Many do no realize that sometimes it can be a better time to sell because of the less competition of homes on the market. In the beginning of the process Penny and Frank needed time to just get on the same page about all the myriad of details involving even thinking about a move. How much could we get for our home? What pricing strategy could we use and what can we hope for in a bottom line- what kind of equity will we take away with us? We were sensitive to them and their situation, because, after all, there is a lot to consider- leaving old friends, creating new ones, figuring out jobs and the best timing etc. As a listing agent, my role was to provide them options and then be sensitive to their own timing or even if they decided to just stay put- I really just wanted what was best for them. I kept in touch with them and appreciated they needed time to figure it all out, when and where and if they’d be moving. I think both Frank and Penny appreciated my advisory role of providing options to them at a time that was sensitive to the both of them coming to the big decision to list the home for sale. After my listing presentation they KNEW they had the right agent, it was just a matter of time. It was so funny, because I asked Frank and Penny from above at the height of excitement of selling their home in December for top dollar, if they knew of anyone else I could help. Penny all serious said, ya, our mailman. I thought, hey, this-asking-for-referrals-at-the-height-of-excitement really works! But it set in that she was pulling my leg big time, because their mail man was the guy that referred me to them! Ha, ha… whom I had already helped buy a home! Oh, well, I’m sure she is still trying to think of that referral for me. Actually, they have someone in mind, just maybe not for another 6 months. Frank and Penny’s home is set to close on December 28, 2015. You can find the Giammona’s testimonial on Google here. Carl & Marty Adle are the funnest ever, they relocated from Norfolk Nebraska. They absolutely love it and their neighbors in Sun River now, whom I’ve also become friends with. They like to swim and exercise- both newly retired and from what I can tell they were the life of the party for their kids and their friends. We closed on their home August 28, 2015. Dennis Schmolke is a gentleman I helped move into a Hurricane home a few years back. He and his good wife were St George temple workers. Dennis’s wife died suddenly shortly after moving in. He has since re-married and as part of that he moved out to Arizona closer to her family and kids. Denny was such a joy to work with and he trusted me and my instincts implicitly which turned out well for him. We DID gain that extra exposure off my website and sold his home in a month and half when the average selling time there was 5 months! He closed just in time for his wedding- a happy man and off to tell nobody but a cactus in Arizona. We closed on November 24, 2015. Mike and Stacey Hansen and family had these two very cute high school teenagers with them. They moved down from the SLC area with Mike’s work being in the field of Emergency Room Cardiology. They needed a place near the hospital. We looked at a few places when they came down early on with no luck. They attended to the email updates I was sending them and this one popped Back On the market after falling out. I immediately went over and took a couple videos for them and they put offer on it pending their coming down the next day or so to look at it. There offer was accepted and had two or three back up offers pile up on top of ours. They were so happy with me being Johnny on the Spot for them and in coordinating with an agent I knew who would also have liked to see us get the deal. It was also joint work on us agents to see that this match was made to happen with this mans profession being to SAVE US when our heart starts to go! He needed to be close! I was so happy to be a part of this! They are such a neat family and St George is better off for having them! They live right along the Virgin River just off Riverside Drive and River Road. We closed July 16, 2015. 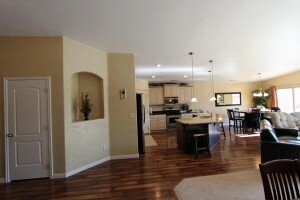 There are a few more for the second half of this year, plus one to go under contract in Sun River this December. It is all because of these success stories that I just LOVE being a Realtor and have many many happy buyers and sellers, coming up on my 12th year of doing this full time. Please, all those that have not known of what I do, I am casting my bread out on the water a little more in letting you know so that you can also feel more comfortable referring yourself or family and friends and neighbors. Thanks for taking the time out of your busy day to read this! Our website is ranked #1 in town- www.st-george-realestate.com and has the most amount of traffic than any other agent or brokerage in town- not a bad place to shop as a buyer or expose your home if you are a seller! One of the greatest resources I have at my disposal for predicting where prices are going to go or stay for the St George Utah real estate market, goes off Supply and Demand. It is not always the case that when supply goes down demand goes up. But it is a pretty safe bet. That is what we have as a dynamic in the market place right now. And when interest rates have not crept up like they are projected to eventually, lower interest rates can also lead to more buyer demand as well. Here in the Greater St George Utah area I have pulled inventory levels for homes and condo/townhouses all up to about the 250 thousand price-point and have seen how inventory levels are about one third down from where they typically are. This is fairly significant. As such it warranted a market update to let buyers and sellers here in the area know. Basically we have more buyers competing to buy the existing inventory perhaps as a result of it shrinking. Sellers can hold out for their little higher price with less difficulty for doing so. I’m projecting that some sellers may benefit with a little 5K difference in price of what they can get for their homes over and above what we would have thought about inventory levels rebounding a little after spring and summer months. Should buyers take a break and wait till winter has past or for a while, until inventory levels re-establish themselves? That is a good question. For most buyers I’d say no, because it is what it is and it might persist after all. Thus, the variable affecting picking up a “good deal” may have not changed, you have to be a little more astute and persistent is all and maybe less frequent… but lucky as well. The deals can still be had. Most sellers and Realtors understand that the market tends to “right” itself such that a seller cannot get too greedy. The comp base of what has been sold does not lie, it is about what things are worth and there are no “sky rockets” in there. However, for some buyers that have time, I’d suggest a twofold approach. Utilize winter months, which allow for some staved off buyer demand to see if you can compete with less buyers to make your purchase happen. Secondly, if it does not present then… then when in the Spring months the builders of new construction have possibly over-corrected for the shortage of supply they had last year, you can act with more plentiful inventory levels. This is theoretical, a tougher market on the builders with more price competition because supplies are higher OR the higher inventory levels in the resale market (works in tandem). Then you could seize your resale or new construction opportunity at any point, during Spring or into Summer- the time when builders all know it slows down for them NORMALLY (not this year, maybe next summer to fall if demand lets up). 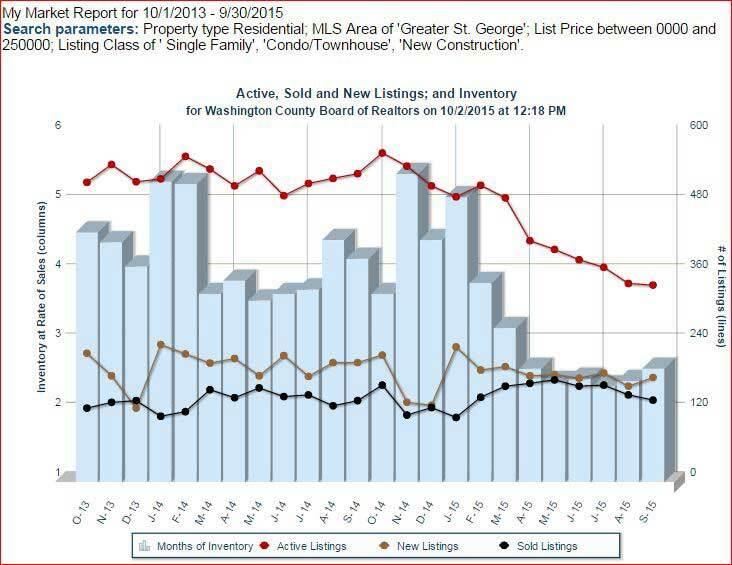 Remember, remember this is no crystal ball, St George is too hot a location, that other factors coming from demand from reallocates could change everything and inventory levels could remain lower. Another variable is this as a buyer: If prices are appreciating in my estimations of about 3 to 5% a year, it won’t matter to hold and buy then if prices are going up anyway. Investors [and maybe other buyers] often pass up good investments and just take too long to buy something decent. If it takes them more than 6 months to a year, the deal they might have been looking for is past anyway, relatively speaking. For sellers, I’ve often seen them think winter months are not the best, when if all the sellers pull off the market, it can sometimes, nay often, mean a very good time to sell with the less competition on there. I hope this market update has helped you to see some variables currently happening in our Greater St George Utah real estate market, helping to inform your ever important decisions involving one of the greatest investments of your lives, your home/condo/townhome. If you or anyone else you knows ever needs the help of a real estate professional- I’m at your disposal, so please don’t ever hesitate to click on Contact Us to get me now or to forward the contact of somebody you know. Thank you! ~ Brian Habel with HomeSmart Advantage at www.st-george-realestate.com. 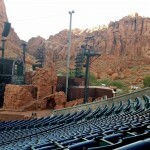 What is so special about the St George Utah area? Two things. What is so special about St George? Two things. 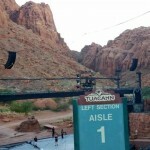 See the full article on Tuacahn's website here. 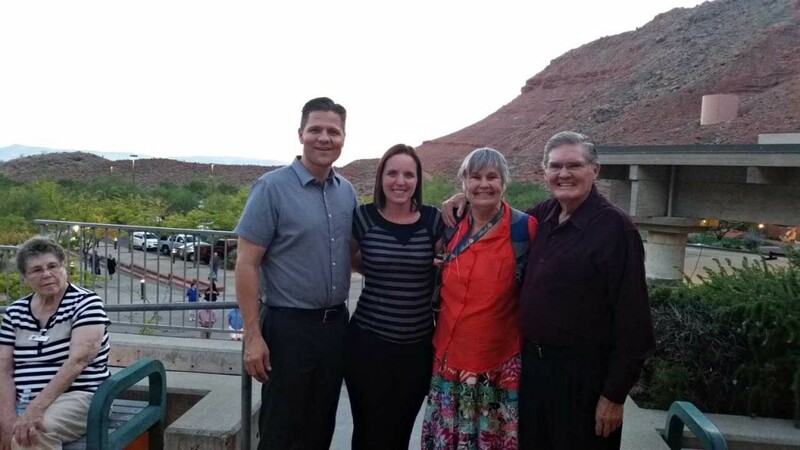 Brian & Kathy Habel with Past Clients, Bob & Judy Watt- going the show Sister Act! 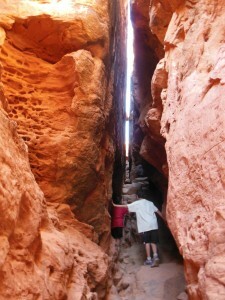 and stroll into areas for hiking like Emerald Pools or Weeping Rock. Town Square Park Hit the county library while you are there, it is fun to see that historical yet newer building of that old sandstone brick outside. The inside has an older flare, yet newer. 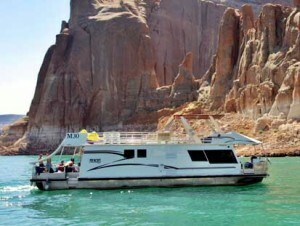 Lake Powell & Wahweap, the second largest man-made lake in North America- most do not realize that we are two and half hours from Wahweap, one of Lake Powell’s more popular House-boating Resort and Marinas. From there many points of interest and activities abound. These are just some of the special day side trips. 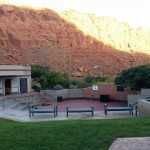 These are a couple of things of what makes St George such a special place to live or recreate to. Brent Bills, a long time friend of many in the Bloomington Hills area used to live in a home on Beach Street. 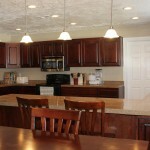 He was seeking a move into a nicer and newer home that would present a good opportunity for him investment wise. 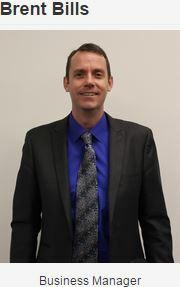 Brent is the superintendant over Finance for the Washington County school district. As such, he has an eye for a good value when we were to see it. 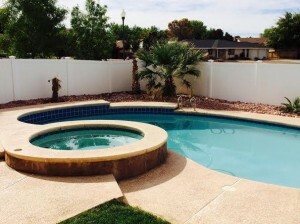 It was important to have a Realtor who was not afraid of work and of negotiating for him. 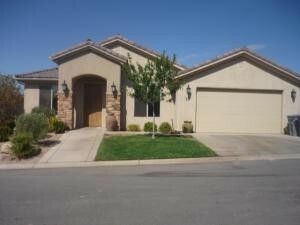 We put offers on several Short Sale homes and then eventually settled on a Foreclosure home. Brent needed a patient Realtor that could play the entire field with him, exposing him to the several opportunities, across several school areas really, as he was friend to them all, knowing the wonderful talent personally in each of them. I asked and he told me that they move the talent around to even it out, making all of “St George” get the credit for wonderful neighborhoods in which to raise families. It is not difficult for me to see how Brent is doing things, lots of other small things that make him very personable, often there to make others burdens lighter. Brent and his lovely wife Cassie could have settled on a home too early in the process had I not a mind to help expose them to the markets opportunities. They got into a better situation as an end result. They were ready to move on the right opportunity, when it presented itself. I think we were proud to realize that they had a little instant equity built right in. The greatest expression of confidence that could have been given, came when Brent & Cassie called me back up, after a few years, to help sell their other home on Beech Street, that they had rented out for a few years. We optimized the best selling price for the few improvements he planned on doing, while trying to sell it. It was Todd Sparks (local Bloomington Hills teacher) who helped him yank out some old looking tile and install new tile for the entry and kitchen. It was beautifully done and the timing was right. In marketing the home, often times you’ll get the most traffic within the first two to three weeks. In optimizing this traffic, we had the new flooring going in, which was perfect for that buyer who we would show to for the second go around. In showing the home to the new family (The Slater Family), I helped share the vision to them about how all their concerns of having a more move-in ready home could be and were being addressed. They really caught the vision of what the home could become like and if you visit it today, you will see that the vision became a reality as they have made that home shine. That vision was realized when we got to work for them and then handed that baton to them. The Slaters have now made a wonderful home out of it (picture inside the TV in the picture collage to the right). Now, having been a commercial roofer in my last career, 12 years ago, there was a leaky situation just up over the overhang window above the dining area, two stories up. I took some of my remnants of an old flat roofing membrane and lifted up some tile to put it under this tricky area where valleys and leaks tend to want to happen to help waterproof these areas for them as it really needed it due to past leakage in this area. Brent Bills is so amazing, because he was still working, on the home, doing things he did not have to do. Literally I saw him over there in the heat of the day and after work hours. 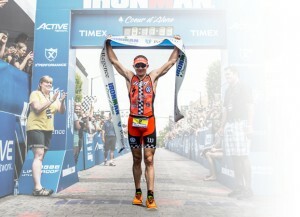 But even as I was feeling for him one day, in going the extra mile, what literally blew me away, was to find out on top of this, was that, all this was being done in the heart and heat of him training for an Iron Man! I have been so impressed by this Iron Community Man! Not to mention that Cassie and Jessica were over helping him and being part of that kind of support when it was in helping do something for others as well. What a support they were at that time when the extra work was not coming back to their bottom line, but another family in how they left a place to them! I’m so appreciative to all involved, from the tile layer, to the families seeking a change. It was my good pleasure to be so engaged in seeing dreams happen for all involved and it is a story that needed to be written. Thanks for reading it! We have worked with Brian Habel in both buying and selling a home. He is upfront and honest in his dealings. He is patient, and helped us find the right home for our family, unlike other realtors that tried to push us into the first house they showed. We rented out our old home for several years before selling it. It had normal renters damage that needed to be repaired. Brian helped us identify repairs and improvements to our home that would help it show and sell better, even helping with some of the repairs himself. Brian always deports himself in a professional manner. He is a skilled negotiator that understands the value of homes in this area, making the negotiation experience short and less stressful. I recommend Brian Habel to my friends and neighbors. He is the best realtor we have worked with. UPDATE through End of May 2015 for All of Bloomington Hills: To clarify, our last blog post on Bloomington Hills was just for Bloomington Hills south. Now we look at the entire area of Bloomington Hills for a few months back, to show how inventory levels of recent have dipped and are quite low. When looking at this, think of a resevoir of water. How long would the current reservoir take to empty [or sell] if no more new water [or listings] came onto the market at the current RATE of sales given new listings over sold listings in the prior month or months? Get MY OWN HOME VALUE instantly on Brian’s site with no hitches. You can see in this graph depicted how it is that inventory levels remain low for our area. 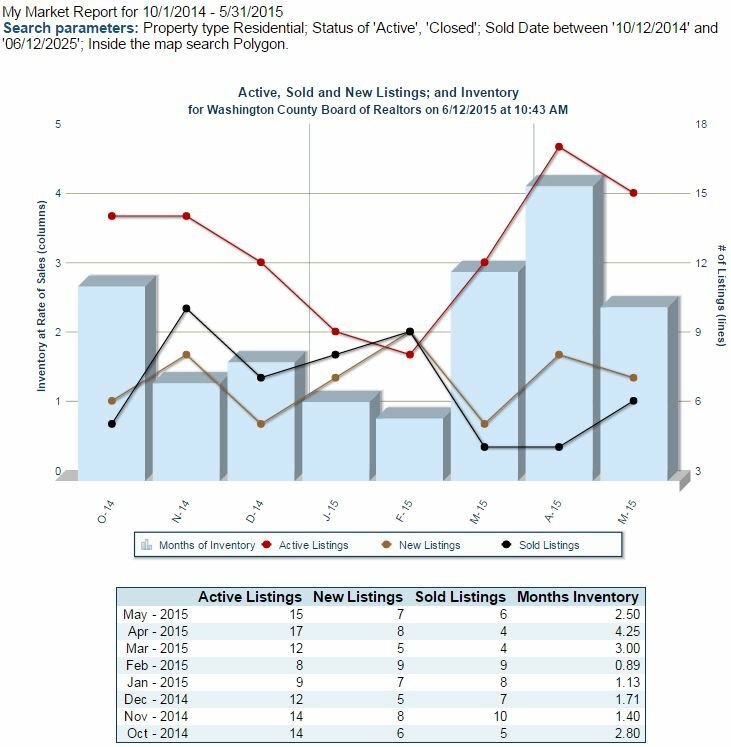 They say a healthy inventory level is about 6 months, and Bloomington Hills looks to be averaging 2.2 exactly from Oct. 2014 until now, or the end of May 2015. 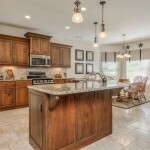 You could say it is a HOT market for Bloomington Hills! In other words, whenever anyone puts something up for sale, it does not last long OR not enough sellers are putting there homes up for sale. The Average Days on Market are indeed low at 58 days to selling, faster than the norm. This latter thing of not enough sellers listing for sale is actually a reality across the nation as well. It has actually made home sales decrease slightly a buyers recoil at the slim pickings. They say nationally one reason is the lack of new construction product as given through smaller lending institutions giving builders loans. I could agree that locally, the lack of new construction options, but only available through the larger builders right now it seems, is driving up those prices and making our “established communities” with good schools look pretty “established” as “predictably safe”. Email me at: Brian’s first and last name @gmail.com, for the above this list of homes to include inside pictures. This is a market update for Bloomington Hills interested buyers, sellers, neighbors or residents. FACT: From May 1, 2014 to May 1, 2015, 28 properties have sold in Bloomington Hills. FACT: The highest Sales price was $335,000. FACT: The average sales price of those 28 properties calculates to $222,121. FACT: The average days on the market has been calculated at 71 days! In an upcoming article I, Brian Habel, will share a couple of success stories of helping one family to relocate here into Bloomington Hills south and another family to successfully sell their home at top dollar. Here are some helpful little numbers that show the supply of active listings in Bloomington Hills south, as to how many sold that month, superimposing that rate of sales onto that months inventory levels. How do our Bloomington Hills values relate to the real estate market at large? To share our market at large I have some graphs below. I then talk about how they relate to our local Bloomington Hills neighborhood. OK, this first graph shows a market that is moderating its price changes to be minimal. CoreLogic reports that of Jan. 2015 home price appreciation for the year was at 5.7%. 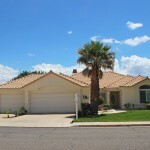 Our local St George real estate market and Bloomington Hills corresponds with the national scene. 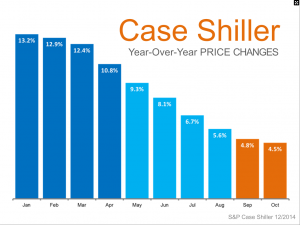 This first graph shows how prices of homes are moderating to less price changes however. Because the real estate market has been strengthening, home prices have been going up. This is moderating to be less the case in its rate of ascending over the prior year. Things have been moderating to less extremes and more conscientious selling and buying here in Bloomington Hills where we all know the school system and area is awesome! Well, local St George Realtors have known that homes have been trending toward less price reductions. This is true for Bloomington Hills. 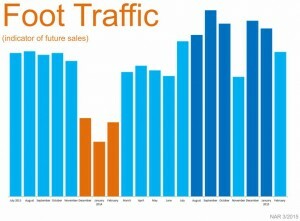 As part of our strengthening market, the graph on the left has shown an increase in foot traffic nationally. 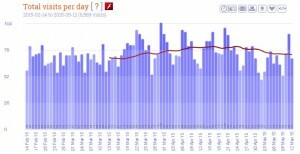 The bars along the bottom go from July 2013 towards Feb. 2015 ending. On the national scene homes sell at about 95% of their full asking price. In Bloomington Hills in the last year, May 1, 2014 to May 1, 2015 the homes have sold for about 98% their asking price. The average selling price per sq ft has been right at about $100 per square foot. So, that means, if you gauge your own home at about average for our area, then you take your square footage and times it by 100 to get what your home is worth. Be careful not to count the same for basements as you would for the main level. It really depends, but basements will pull around $60-$70 a sq ft… or $70-$80 for walk-out basements, or even more for nicer walk-out basements. Second levels tend to do a little better than basements, but it really depends; some on the area, year built and positioning of that second level, if it provides views or not. Another thing I wanted to help show is that all the national forecasts have predicted that interest rates have nowhere to go, but to rise. Here are the projections for interest rates- see graph on right. OK, how the interest rates affect everything is really that big smoking gun later on- it could be minimal, like a cap gun or most likely huge, like a shot gun. 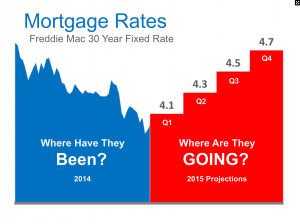 If interest rates go up, it will affect affordability and could make for less buyers being able to buy. This could then lead to less demand on homes, therefor a stalling of price appreciation on those homes. For sellers, this could mean that they cannot get any more out of their homes than what they might try to do now. Conversely, if interest rates do not go up that fast, it might not affect things, but minimally, with the need people have to still relocate, up-size and downsize. The antsy Realtor in me wants to protect peoples interests and hedge that interest rates might affect a prior volatility in the lending market, to say that the lending, as to affordability in payments being low, doesn’t get any better than right NOW! It is an excellent time to buy and sell! If interests rates go up more drastically, it could affect buyers AND sellers negatively. I wanted to put this graphic in to emphasize that while information, now-a-days, has become just as readily available to the buyer or seller directly, rather than just through their Realtor, that they still do rely even more heavily upon their expertise when it comes right down to it, precisely because their has to be a last filter in which to make sense of all the information that is out there. I wanted all my friends and neighbors to know here in the Bloomington Hills area, a little more about me, that I’m poised to give you all the help you, or anyone you might refer me, the specialized help they need. 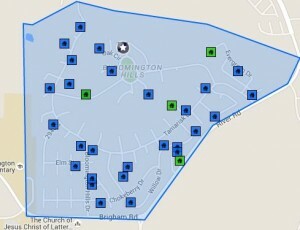 To the right it shows I get about 75+ people a day to my site searching for homes. 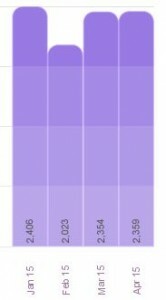 The graph below shows how that equates to about 2,300 people a month!!! 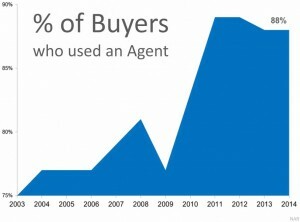 When it comes to selling, almost every Realtor will hit on the number one factor that can work in your favor- EXPOSURE. Well, having the number one website in the St George area, dwarfing possibly most all the Realtors traffic combined and any single Realtors traffic combined or any agency for that matter- I can expose your home the most. 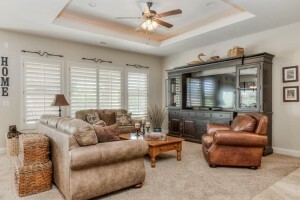 We then synergize that effort with proper pricing, pictures and virtual tours. Please see our website and refer with confidence! Of all the commodities still left to tell what ranks important on peoples radar screen for relocation, still, St George mecca will keep coming back to show that it “Has the Goods”. And what “pray tell” helps to decide that St George is a good place to relocate? Well, its best commodity is its people! Second, are the variables leading to what has attracted such good people. 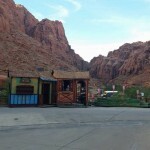 While much of commerce is telling and deciding what and how many people flock to certain areas in the nation, the goods and services marking St George Utah on the map, while varied, are still simple and sweet. First we are located very conveniently as a stopping place between the north and the south, located in the west. While Las Vegas has traditionally been a hub for much of commerce distribution throughout the west, St George is this little dot on the map, 2 hours north of there, which represents the last known region of warmer and milder climate before heading north into an entirely different set of colder weather variables. So, yes as a stopping place, the fact of Zion National Park like scenery, only located 45 minutes from us, does hold some charm. And yes, the red rock and red dirt and corresponding sunsets and sunrises do make us glow a bit- as vistas of red mountain desert burst upon the senses. But most of all, this old pioneer town, seems to tell people when they meet the rest of St George -its people- that very few places tend to meet and greet them quite like we do! Yes, many have remarked that the most notable feature marking St George on the map is its friendly people. St George’s history involves a local concentration of a predominant culture of people belonging to The Church of Jesus Christ of Latter-day Saints, called the Latter Day Saints or LDS (nicknamed the Mormons). They currently make up approximately 50% of its population. The area has been inundated with seasonally affected individuals mainly from the north, Salt Lake City and into Idaho. These people, largely holding onto traditional values, have all come down to St George, it having been a traditional harbinger of colonizing, to get out of the cold, to retire, to also vacation/recreate and second-home to. This element of locals, not just the LDS of course, congregating around the milder weather, lots of golf courses, traditional values keeping taxes and overspending in check, desert meets mountain and rock and its subsequent unique scenery, have all set the stage for a community that other non-local people find as a refreshing breath of fresh air, foreign to the more smog filled air of urban troubled cities. As a result, St George has become increasingly diverse in its population. 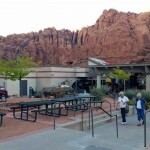 Greater St George is comprised of St George, Washington, Ivins and Santa Clara. Each holds to their unique piece of the scenery. St George is nestled down in at the base of the hills and sits at the foot of the Pine Valley mountain- the mountain sitting due north. Washington is set out mainly to the northeast and then east into some flatter area, called “The Fields” or “Washington Fields”, thus appreciating “look-up-to-see” views of Pine Valley Mountain. Lot sizes tend to be a little bigger out in “The Fields”. Ivins and Santa Clara flares off to the west running along some of the most prestigious lava and red cliff rock formations of the area, with Snow Canyon parkway running out along that into Snow Canyon State Park. 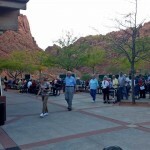 A little enclave of cliff area nestled just to the west of Snow Canyon State park entrance is the Tuacahn Amphitheatre, an open air amphitheater where the red rock cliffs in the background are the setting. Thus, St George enjoys a unique appreciation for the Culture & the Arts. Many noteworthy plays have been conducted out there, to include Disney giving them permission to do shows like Aladdin, Beauty and the Beast and The Little Mermaid. For one show, the Big River (Huck Finn), a man made river of water in the backdrop was diverted out over the stage to form the river area for the Huck Finn man-made raft to pole through. The real estate all has an illustrious appeal with all this scenery going on. Granted, it is a desert meets rock and mountain type. 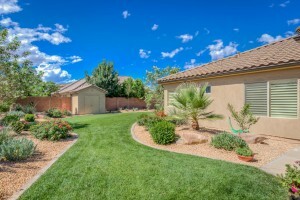 Feel free to search the various communities and St George Homes for sale here. We think its predictable, here at St George Real Estate, that St George will become increasingly diverse and come to represent a sort of movement of people trying to get back to basics- nature and the simple life. Good values, friendly people, quaint small town feel with tourism’s scenery, and sprawling infrastructure, to include a new regional airport and beltway loop built out ahead of its time- all bode well for an upcoming future of population growth and expansion to include people looking to relocate. 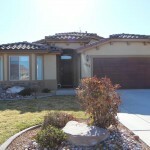 One of our very trusted mortgage lenders in St George Utah says that loan terms are improving. I spoke with Steve Stout and Chantry Abbott at SGI Mortgage. 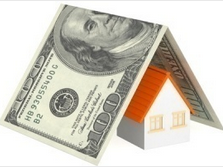 The FHA on the January 15th lowered their monthly mortgage insurance premium by 50 basis point. It used to be that you take the loan amount times 1.53 percent, times the loan amount, divided by 12. Now it is loan amount times .85 percent divided by 12. Depending on your loan amount that could be anywhere from 50 to a 100 dollars a month savings. For those new to the scene, the mortgage insurance premiums went up and the up front amount you had to pay, based on our recent housing disaster, such that these types of loans could be looked at as less desirable. Well, they’ve been easing up some as evidenced here by lowering the premium. Next year Hud anticipates that 100 to 200 thousand FHA-insured buyers will refinance. But if you are in this boat and thinking of refinancing, you also might check in with other loan programs as there might be a better loan program with still a very low interest rate. Steve reports that interest rates are at all time lows. The FHA rate yesterday was, with a couple discount points, at 3.25% and about 3.875% for conventional. I’ve been referring business for 10 years over to Steve and Chantry at SGI, as an excellent Mortgage Lender in St George Utah, and fully endorse them as a reputable place of doing business in an honest and decent manner. Everyone has been fully pleased and satisfied with their services. I refer them with confidence. You don’t specialize with retirees for 10 years and not know a pattern guaranteeing they are rather served to the fullest. I’ve had nothing but good things said from having referred them as a source to trust!